Our trip has now come and gone, and we're done, now left to ponder all we've seen. 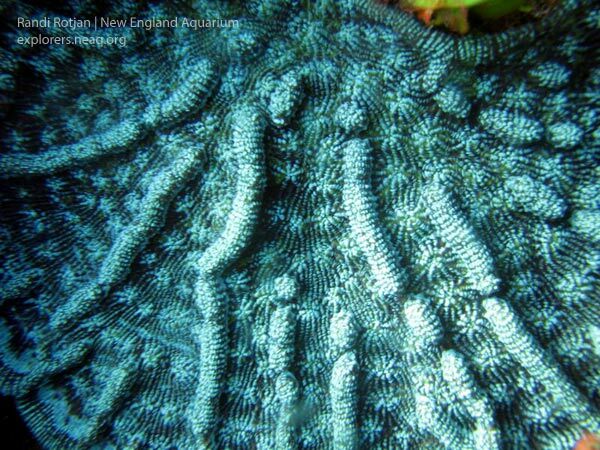 Large fans of black corals (Antipatharians) and the hedge-maze patterns of Mycetophyllia corals are still picturesque on deeper reefs. The nice thing about a trip to Belize is that it is a place where I have been working for ~a decade now. It's my home reef—the reef that I know the best. 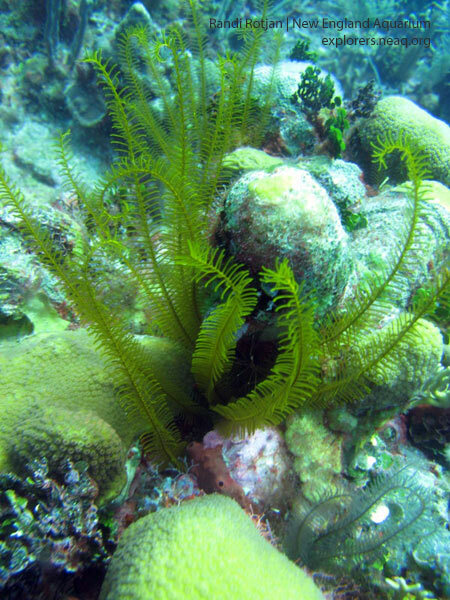 Algae (mostly Dictyota) overgrowing much of the surface, prohibiting the growth of corals. A large number of algal-gardening damselfish have claimed the dead skeletons of once-dominant Acropora cervicornis (staghorn corals) for their homes. 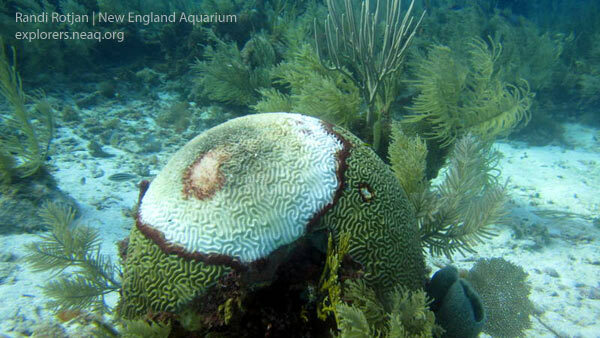 Coral disease (here, black band... ) is still seen on the reefs. 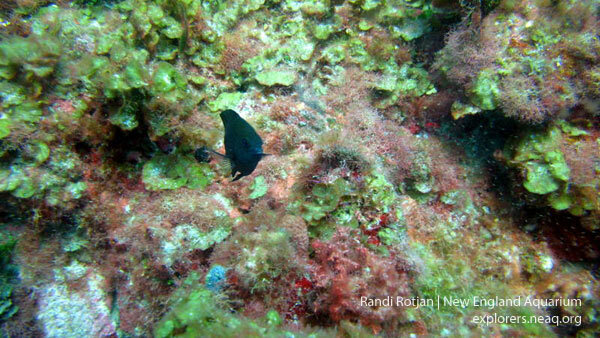 Every day, we (literally) go up and down - our daily commuting dive from the surface to the reef. It's a bit of a rollercoaster, constantly scurrying to complete work before air or bottom time run out, then carefully ascending to the safety of the surface only to repeat the experience a few hours later. 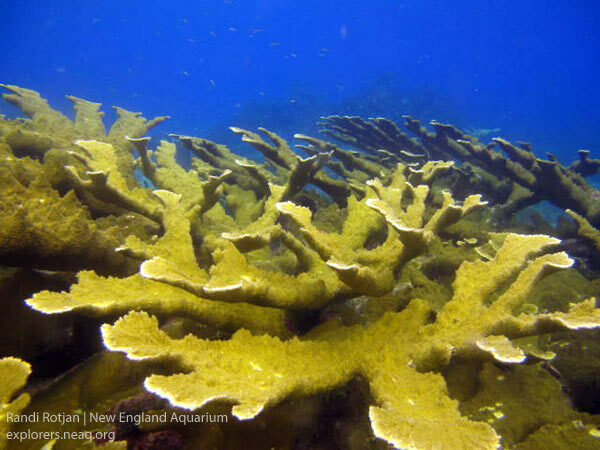 But also some good news - fast growing thickets of Acropora palmata (elkhorn coral) are bursting in the shallows. The physical rollercoaster is a typical part of the job, and we're all very used to it. But the ups and downs of reef status is a whole other kind of experience—elation with a healthy stand of large and thriving corals, sadness when a formerly coral reef is covered in algae. We see both the good and the sad here in Belize. While Pete measures fishes, it's my job to examine the corals and other benthic (bottom) dwellers and record their status (diversity, abundance, size, health) in each habitat. 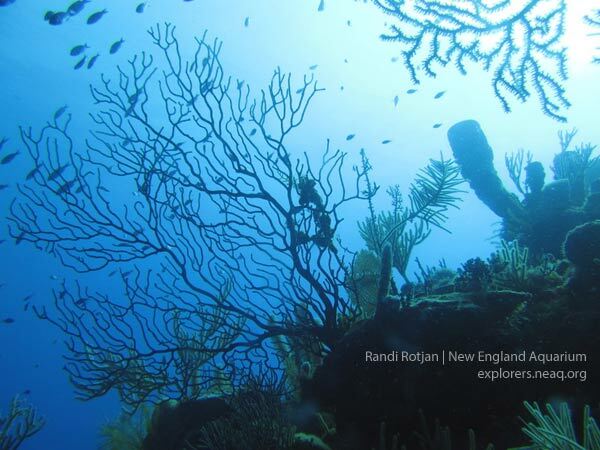 Crinoids wave their golden arms from coral crevices. The future of the reef is uncertain at this stage; all we know for sure is that the ride isn't over, and we're probably due for some more twists, turns, and loops. But I take heart in the healthy stands of large corals that we see in some areas, and hope that on the next trip we'll have more "ups" than "downs". See pictures of some of the noteworthy larger animals spotted during the expedition. Get to know a small feisty shrimp on the reef—stomatopods. 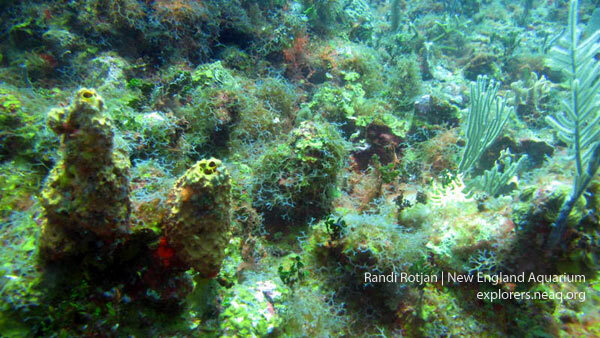 Take a gander at some of the curious coral colorations Randi came across during her dives. Meet the next generation of reef residents—reef babies here and here! Come on land to see the magical signs of an egg-laying turtle visitor. Very nice analogies, Randi. A story well-lived and well-told too!